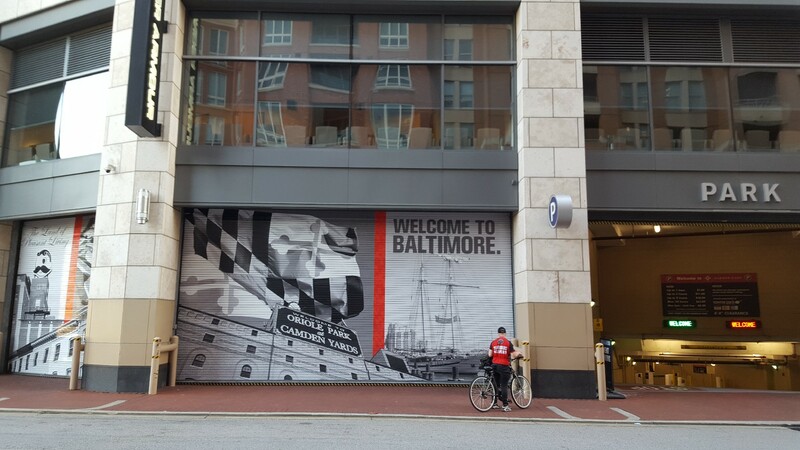 Our 2017 Road Trip, Part 10: The Road to Baltimore « Midlife Crisis Crossover! A familiar face to longtime readers. After we descended the far side of South Mountain, our destination Baltimore was just over an hour away. In the late stages of our pre-planning, I realized we might have time for a detour to the southwest before getting back on track. We considered taking the opportunity to veer into Washington DC and checking out one of many sites that didn’t make the cut for our 2003 road trip to the area. Unfortunately by this time it was late afternoon, and we don’t care to arrive at hotels in the middle of the night. Ultimately we made a judgment call and stopped at just one of the chosen options on this leg — the one that represented an open box on one of Anne’s travel checklists. …and Wheeling, WV. Bethesda’s own was our sixth sighting of the twelve. Reaching the halfway point on a goal is a nice feeling. Getting there was a bit awkward. Interstate traffic on the way to DC was the most crowded and least flowing of the day. The closer we got to our target, the vaguer our directions got, both from Roadside America and from Google Maps. When I was confident we were within walking distance, I pulled onto a side street, made two more obtuse right turns, and aimed for the first public parking garage I found, below a well-kept retail block already closed for the day. Underground was nearly deserted, but the gate let us in without issue. 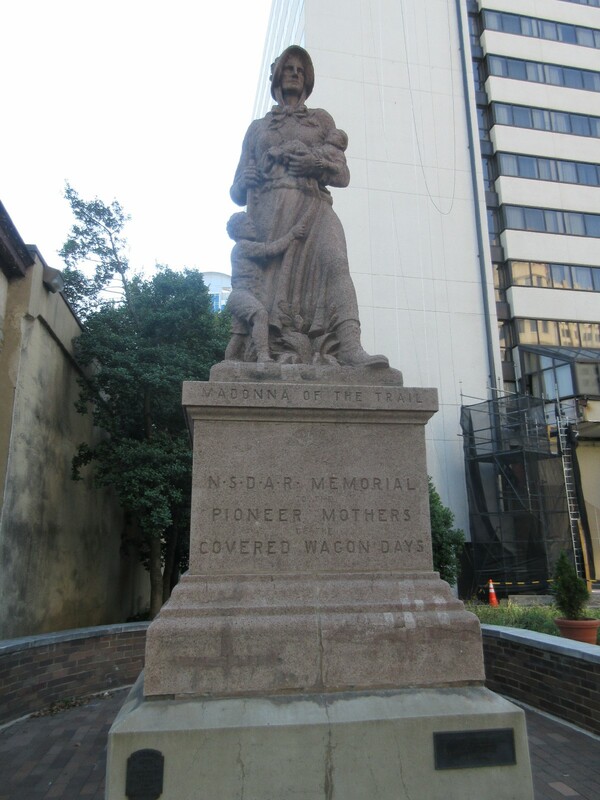 We rode the elevator to the surface, walked south past three more stoplights, and there was our Madonna, next to the sidewalk and unceremoniously wedged between a concrete wall and a Hyatt whose first floor was mostly closed off for reconstruction. Usually they’re in lush city parks or at least in the middle of a grassy patch, but the scenery around this Madonna seems to have been obliterated by quote-unquote “progress” over the decades. I’m guessing she would’ve been demolished long ago if it weren’t for the DAR’s foresight to lock down their squatting rights. Decorated shopping plaza, I think. Valet area guarded by inanimate lions. There’s no need to know why they’re there unless you forget to tip. 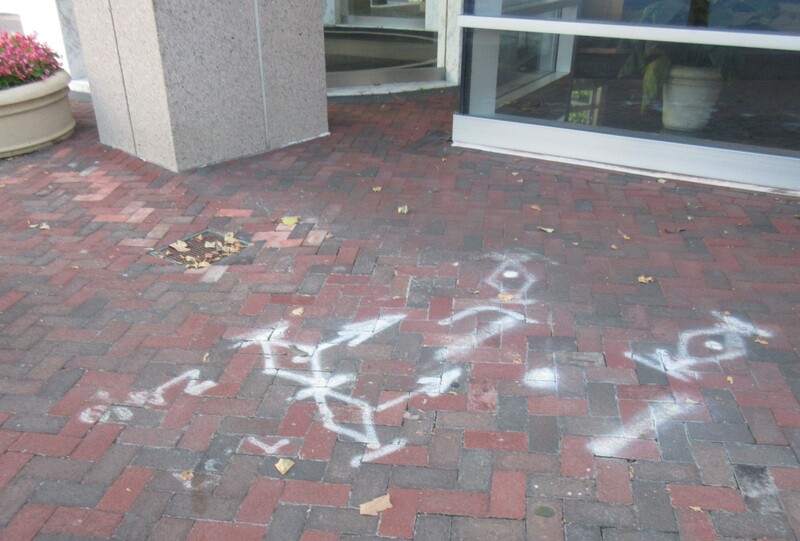 Chalk outlines of either TIE Fighters or possibly the springboards from Donkey Kong Jr.
We made our way back to the garage, only to find the door we’d used locked from the outside. We hadn’t expected that. I suppose that’s what we get for meandering around stores too late on a Sunday. So we had to go around to the back of the building, walk through the gate where I’d driven us in, and head down the ramps till we reunited with the car. Thankfully the gate let us pay and exit, though five bucks was a bit much for a ten-minute stroll. Retracing our steps to the interstate took slightly longer but worked out, or else we’d still be stuck there doing laps around Bethesda today. Next stop: at long last, Baltimore — up I-95 to I-395 and toward the heavily tourist-infested area around the Inner Harbor. Much as I’d love to say we spent our next three days retracing great moments from The Corner and The Wire, Anne said no. We did eventually find a couple of locations from Homicide: Life on the Street, but they weren’t our first stop. 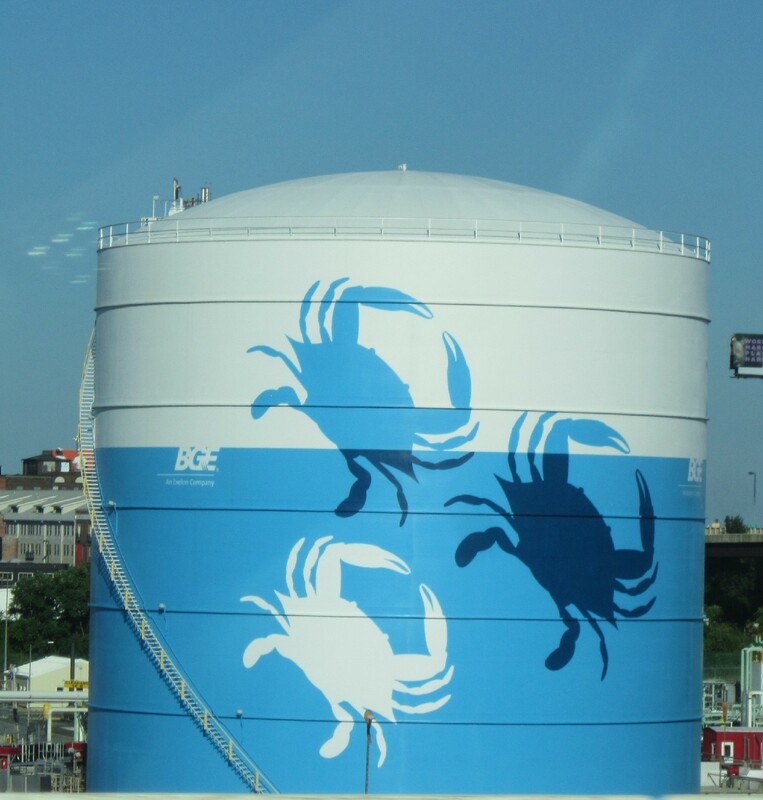 When I mentioned Maryland’s pride in its crab industry, I wasn’t kidding. M&T Bank Stadium, home of the Baltimore Ravens. One of the many lucky parts of this year’s trip is no one in Baltimore hassled us for that whole touchy Indianapolis Colts situation. 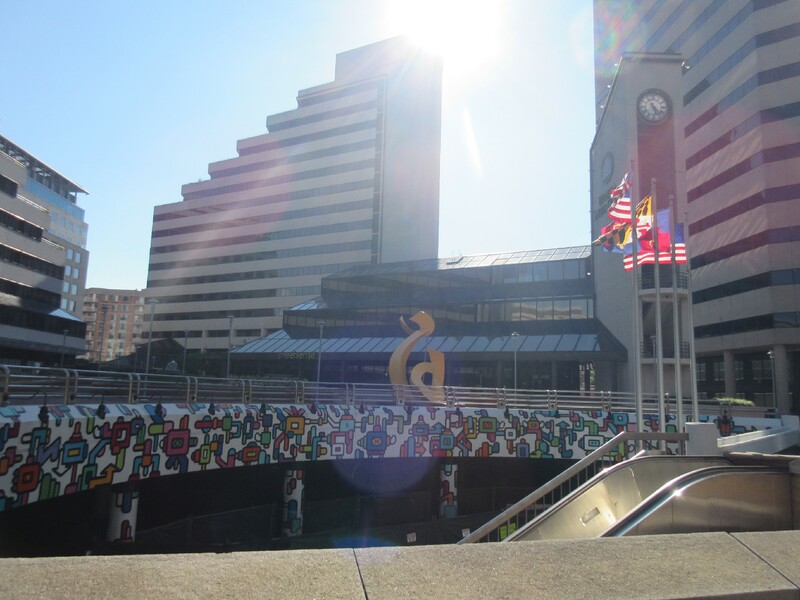 Downtown Balto! Charm City! Bawlmer! Bodymore! And so on! 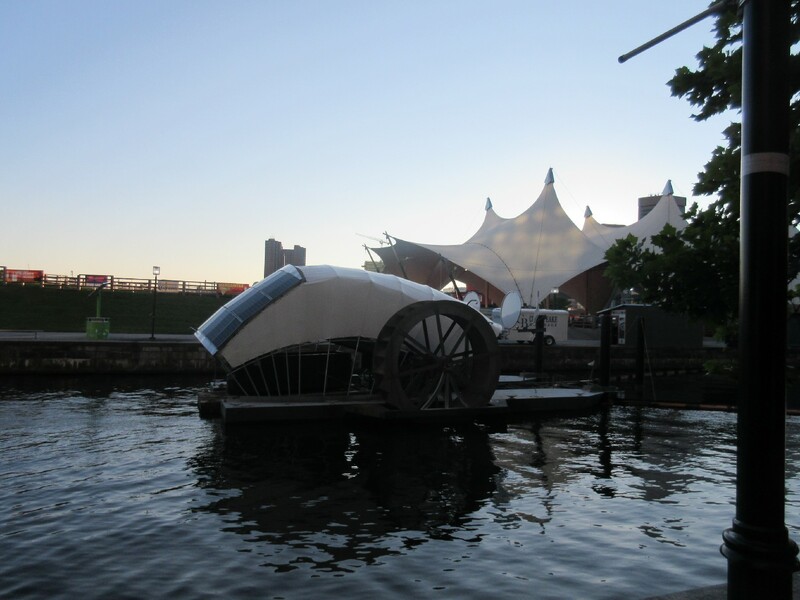 Tourists spend most of their time around the Inner Harbor, where many of their museums and water taxi services are bunched at the end of the Patapsco River. For cost-cutting purposes our home base wouldn’t be right where the action was, but at the “other” Hyatt northeast of the harbor, near the border of the Fells Point neighborhood. As we got farther from the water, the gloss and sheen of outsider friendliness gave way to actual city life — rough around the edges but not necessarily scary if you comport yourself with confidence and don’t do anything blatantly stupid. Our third-party parking garage was a block away from the Hyatt, requiring a bit of extra lugging and walking but saving us a good $80+ over the Hyatt’s valet service. We’re usually not valet people if we don’t have to be. The Hyatt Place interior looked like nearly every other Hyatt Place ever. This one was only a couple years old, an expansion from the older, pricier Hyatt Regency nearer the Harbor. It’s been our experience that newer hotels tend to feel shinier, look flashier, and run more smoothly. That sounded fine to us after the long drive. Our check-in turned extremely awkward when the clerk could find no record anywhere in their systems of the reservations we’d prepaid months in advance through AAA. I had a printout of my confirmation email. It didn’t seem to help much. Eventually the manager came over, probably clicked the exact same buttons, then told the clerk, “Just walk it in.” I’ve never been a hotelier, but I’m guessing that’s code for “Just give them a room and move on.” Smiles became a bit more strained, but the point is we would finally have someplace where we could put our stuff, which grew heavier in our arms as they took their time sorting their failed communications. Once they moved on, the clerk asked us if we had any sort of room preferences. Anne, not quite sure of the overall layout of the area, asked if they had any rooms with a view of the Harbor. The clerk did the best she could with what she had to work with. This was the view through our modernist floor-to-ceiling window. It’s MCC puzzle time! 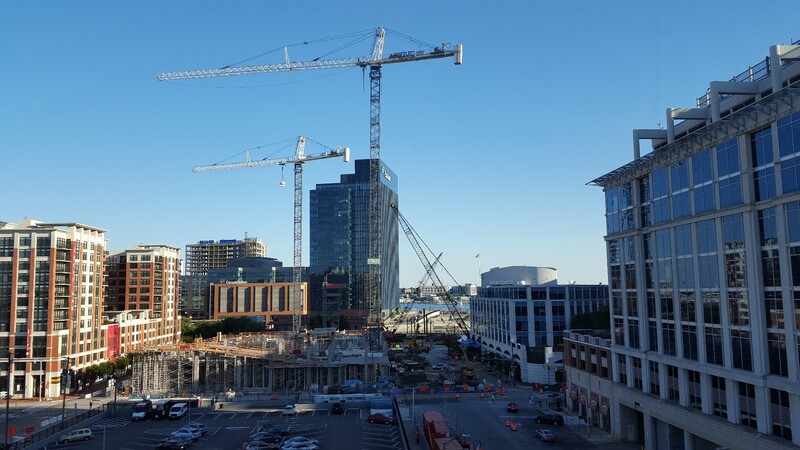 can YOU spot the Inner Harbor in this photo of so much heavy-duty Baltimore city construction? One of the Hyatt’s two elevators was broken down, having come off its tracks or somesuch earlier that day, necessitating long waits for the other working model. That put them on par with the Comfort Inn Times Square where we stayed the previous year in Manhattan. We could bear the inconvenience. After the slow ride and the ritual divesting of all the crap we were toting, we had just enough daylight left for a short stroll toward the Harbor. We scoped out the drugstore across the corner just in case, spotted one restaurant we’d try later in the week, and just so happened to wander near the National Katyń Memorial. This 44-foot-tall statue was erected in 2000 as tribute to massacre victims in general and in particular the 1940 Katyn massacre, in which Soviet police executed 22,000 Polish citizens and officials as part of a pact between Germany’s world-infamous Nazi regime and Russia’s communist leadership. Later their negotiations fell through and Russia technically switched to the “good guy” side of WWII, but that may not have impressed the 22,000 slaughtered Polish overmuch. 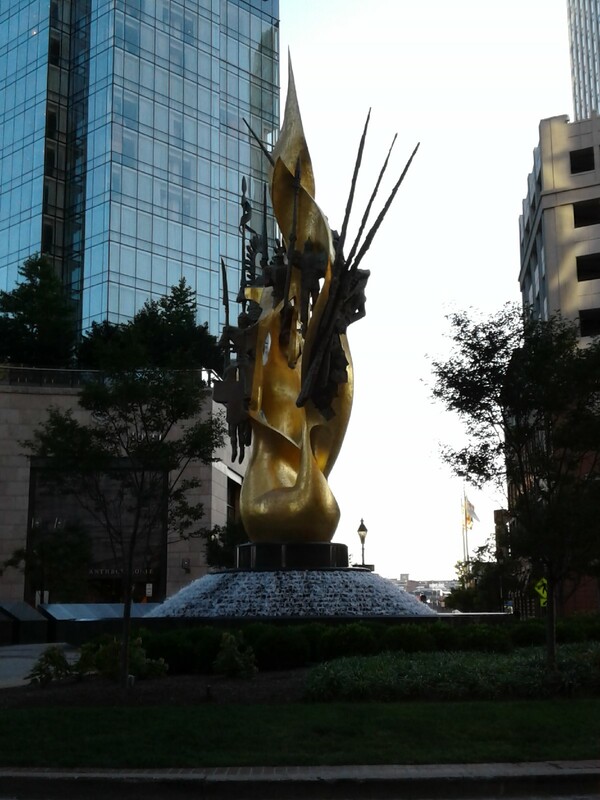 For more information you can check out the official website of the National Katyn Memorial Foundation, headquartered in Baltimore. Then you can shake your head at internet randos who swear communism has its cool points. Our lunch at Bonnie’s at the Red Byrd had been so late in the day that neither of us had the appetite for a full meal, but dessert seemed a justifiable reward for another day of road-tripping success. Right on the Katyn Memorial roundabout is a Häagen-Dazs shop, which Indianapolis hasn’t had in years. 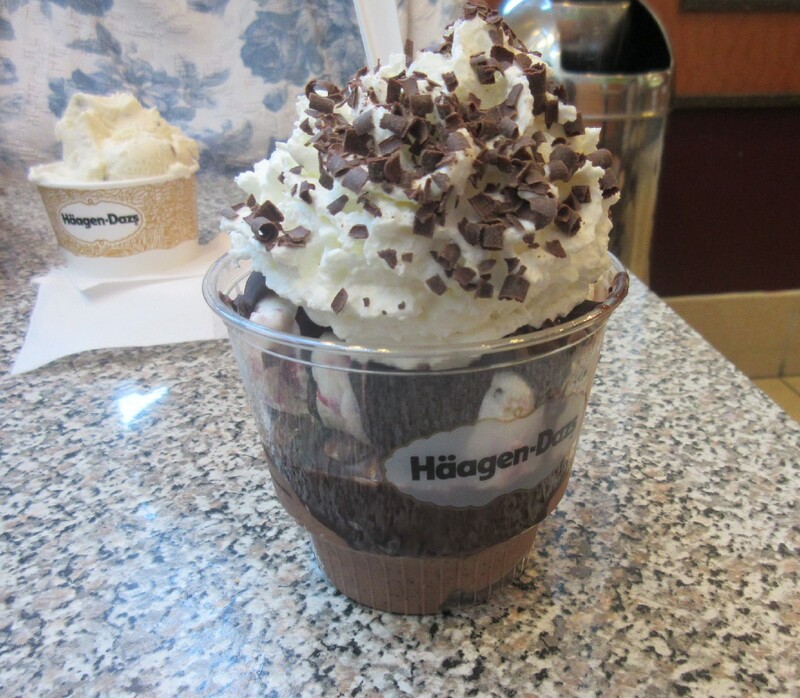 My indulgence of choice: a white chocolate raspberry Truffle Trio sundae with dipped chocolate inside. Idling humbly in the background is Anne’s scoop of butter pecan. 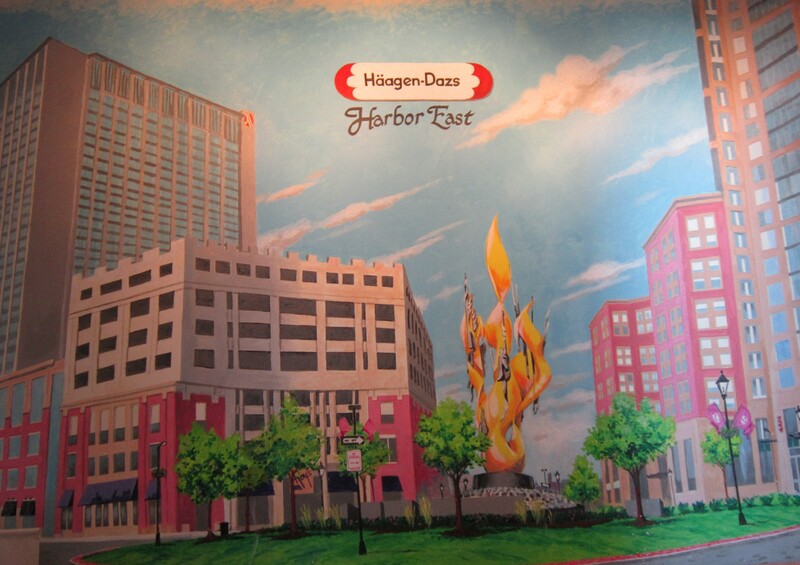 A mural inside the Häagen-Dazs salutes its own location as well as the Katyn Memorial. 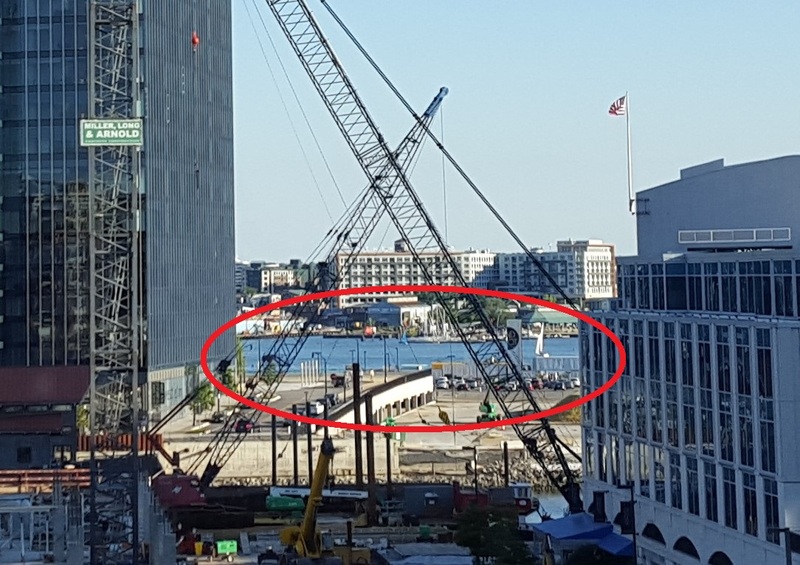 With a few more minutes left, we skirted the area of the Harbor East water taxi station and got closer glimpses of the Harbor, but decided to save the full Inner Harbor experience for the next morning. One of many random watercraft docked around us. 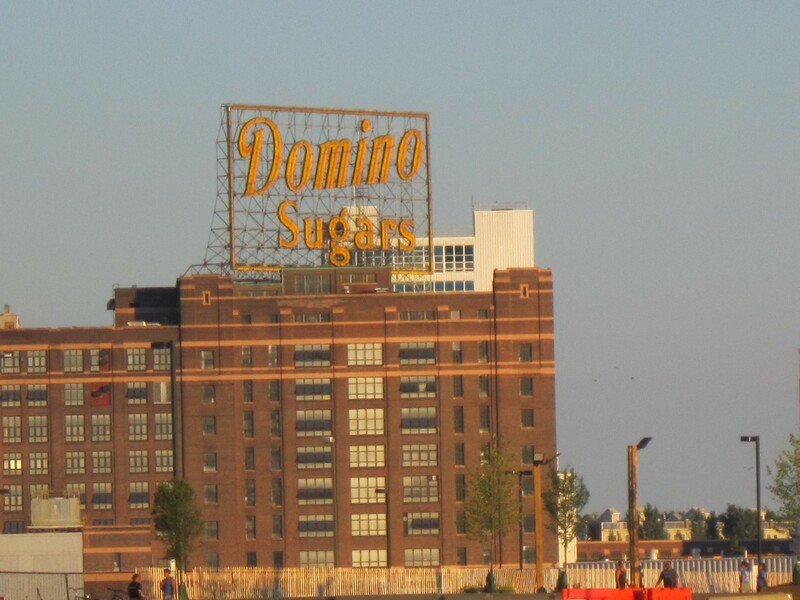 Among the many unique buildings visible on the south side of the Harbor is the Domino Sugar plant. We hear it looks prettier at night when the neon’s lit, but night walks weren’t tempting to us. We returned to the Hyatt, waited forever for the one elevator, rode up to our room, and stopped short at the door. Neither of our room keys worked. 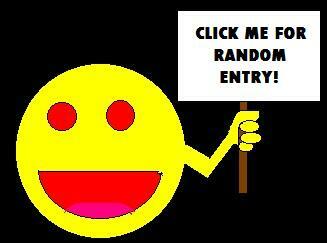 We’d entered earlier just fine. All our stuff was inside except what was in our pockets. At first I panicked a little inside and wondered if they’d decided to revoke our stay after failing to locate our reservations, and had decided to evict us via passive-aggressive approach a la Milton’s firing in Office Space. (“It’ll just work itself out naturally!”) Anne stayed put while I waited forever for the one elevator and returned to the front desk. They theorized perhaps the keys had been pocketed too closely to other cards and had demagnetized. They reloaded the cards and bade me go try again. I waited forever for the one elevator and rode back up to our room. Neither of the refreshed room keys worked. Anne stayed put while I waited forever for the one elevator and returned to the front desk again. One of their maintenance men happened to be hanging out at the front desk and noticed me approaching with cards in hand. He identified himself, asked what was up, and joined me in waiting forever for the one elevator and riding along back to our room. He tested the door with his master key. The electronic lock wouldn’t open. His conclusion: the lock’s battery was dead. He would have to jump-start the lock using a handheld battery-jumping device, which of course wasn’t the kind of tool that fits on a handyman’s belt. The three of us waited forever for the one elevator and returned to the lobby, where Anne and I plopped down in cushy chairs while he went in search of the device, whereabouts vaguely recalled. We turned in exhaustion to our phones for silent distraction. My battery was under 30% and would need its own jumper cables if the Hyatt obstacle course continued for too long. Ten minutes later he found the device in a back room as well as a new battery, or recharger or magic wand or whatever it took to make the door work for the rest of our stay. We waited forever for the one elevator and rode back up to our room. A few minutes’ finagling finally popped open the door. He borrowed the room’s desk chair and swapped out the battery while we collapsed and tried not to scream into our pillows while he was there.